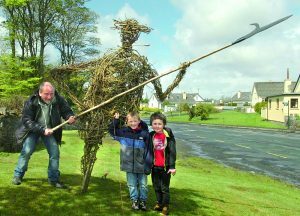 Willow sculptor Denis Quinn, with helpers Dwane Lally and Cuain Murphy, at his Pikeman creation which adorns the entrance to Mayo’s historic town of Killala. The Pikeman was created in association with National Craft Bomb Day, and Killala has been festooned with colour and decoration – pom poms and plaits on poles and decorated doorknobs and some wild window dressing and all done in secret. Next week the Western People will exclusively reveal the story behind Kilala’s crafty folk.